I try not to ask for too much help on here, but could definitely use a little help to continue getting out word about Trout Zone Anglers. Right now, however, I'm unashamedly asking for a specific favor. With Facebook, it is difficult to increase the number of "Likes" and people following without paying Facebook some money, and since money is tight, I was hoping I could persuade each of you who has a Facebook account to just head over to our Facebook Page for Trout Zone Anglers and hit the "Like" button. In addition, it would also be helpful if you would share the page to help gain exposure. 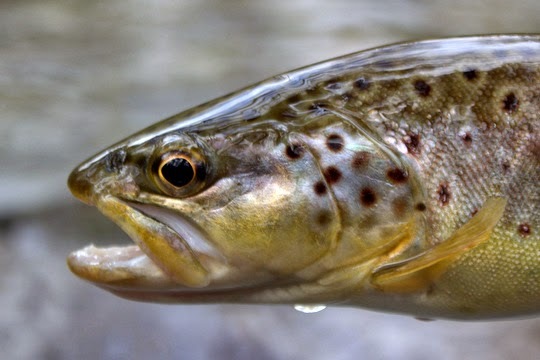 Finally, if you know anyone who is looking for a guided wade trip for the Great Smoky Mountains or the Caney Fork River, please let them know about Trout Zone Anglers. Thank you for your help!!! As our last heavy rain is now something of a distant memory, I can officially say that it is tailwater time. Here in Tennessee, something like that could change at any moment so don't hold your breath. 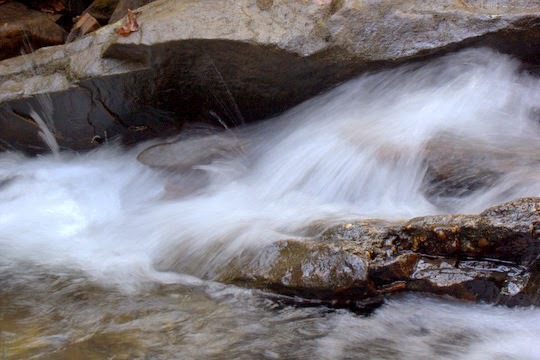 Thankfully, area tailwaters are finally offering some wade opportunities for fishermen. In fact, we are in something of a dry spell with some areas approaching a 5 inch rainfall deficit for the year. After months of heavy water, that first exploratory trip is always an adventure, and we're never entirely sure what we will discover. Spots that used to be at least knee deep are now closer to ankle deep, while other holes have been cleaned out and deepened. Trips like this should always be done with friends. That way, if the fishing is bad, at least the company is good and you can trade fishing stories. Accordingly, plans were made with David Perry of Southeastern Fly for another Caney Fork float. If you are looking for a good guide for a drift boat trip, look no further. David knows the river and he knows fish. His stream side lunch is always fantastic as well. We planned on launching before the generators shut off to allow us some time to fish on higher water. Our hopes for some shad coming through the dam were quickly dashed, but that didn't mean the fish weren't biting. Donnie was fishing with us and had graciously given me the front casting brace. That didn't stop him from starting out with the hot hand though. 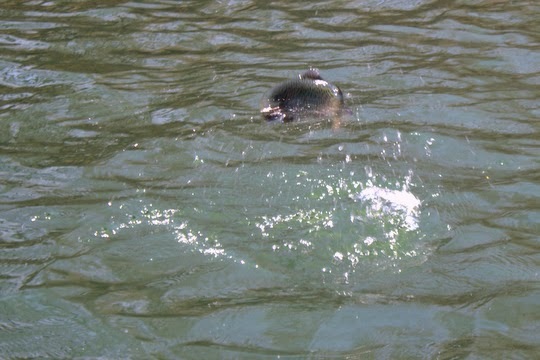 He soon had a fish boated and before long we left the dam pool and started drifting. Relaxation was not in the cards on this day as the wind blew steadily upriver, often gusting enough that making progress downstream required more than a little muscle behind the oars. Despite the wind and cold conditions, a few fish were caught. Donnie kept the hot hand by boating some nice rainbows and one pretty brown. David Perry had to maintain his status as big fish magnet by boating the best rainbow of the day that was pushing 16 inches, but otherwise we caught average stockers. I amused myself by catching a few fish, rowing through some nice windy stretches, and playing with the camera. Here is one of my efforts to catch a fish in the middle of a jump. The downside of this trip for me was that we never saw any big browns. Of course that doesn't mean they aren't in there so I'm not too worried, but I do miss the good old days of having a river full of nice browns. I'm excited for this year and am expecting great fishing opportunities. If I can help you with a wade trip on the Caney, please contact me! If you have not yet checked out my photo blog, please head over to David Knapp Photography and give it a look. I have been trying hard to provide a lot more updates so there are some fresh pictures, some of which have been posted here at some point and some that are new. Today is a great day to sit inside and read, tie flies, and look at old pictures. I woke up to see snow coming down outside. Not enough to stick thankfully, but there are still more than a few snowflakes floating around out there. This morning I'm thinking of the beautiful weekend we had. On Saturday I got out and hiked in the afternoon, and on Sunday I floated the Caney Fork with David Perry of Southeastern Fly. More to come on that trip in the near future. On my hike, I saw something that is actually pretty routine, but it never ceases to amaze me. How in the world do plants grow in the little tiny cracks in rocks where you often find them? This shot is looking straight down into a beautiful pool. 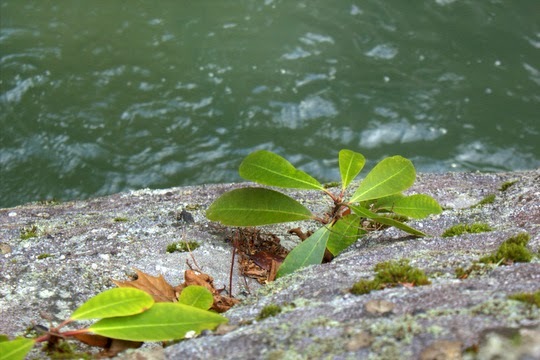 The rock is nearly vertical, and in the tiny crack on the rock face was not just one but two or three rhododendron plants. How do the seeds even find their way perfectly into that spot to begin with? I guess it is just another example of the beauty, wonder, and mystery of nature. Have you ever been in the grocery store salad section and noticed how many types of salad mixes there are? The one that always makes me wonder is called a "spring mix," but for some reason it is available year round. Maybe there are just a bunch of confused plants somewhere. 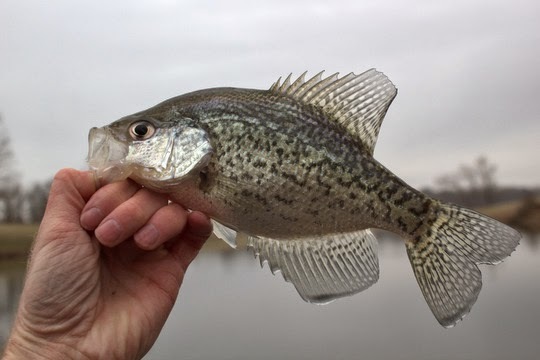 As it turns out, my favorite spring mix is not the salad, but the mix of fish available this time of year in some of my warm water ponds and lakes. 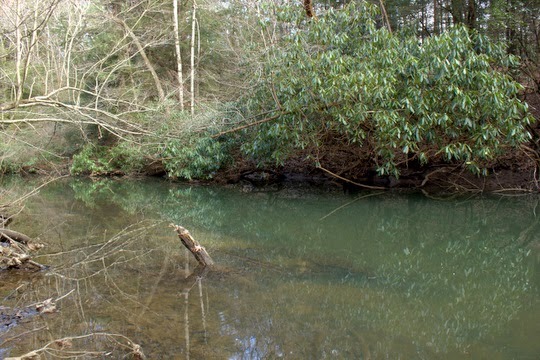 Two good options exist nearby that are stocked with trout during the winter. 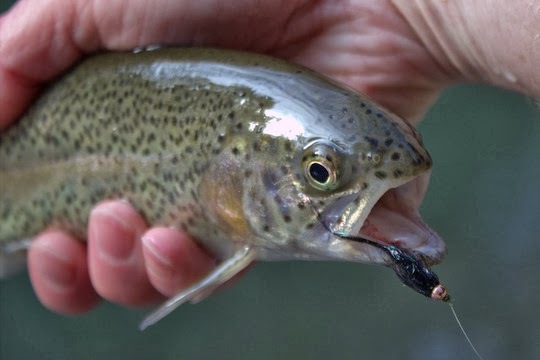 That means that as the waters warm, I can go on a trout trip and also scratch a bluegill itch while I'm at it or the other way around if that's what I'm feeling for that particular trip. Anyway, this past Thursday it was a trout trip first of all. Back at my local state park, I found the creek's waters even calmer than before, same thing with the lake for that matter. So pictures of the reflections I found along the banks and shoreline were back on the agenda. The midge hatch that was barely happening on my last trip has progressed nicely. In fact, after brushing off one insect it occurred to me that I probably should have checked to see if it was actually a midge or a mosquito. I'm hoping midge on this one, but I guess it is close to that time of year. Anyway, so the fish were rising to a pretty decent midge hatch, but I wanted to watch them chase down my fly. Since they are still relatively fresh stockers, I knew that I could count on them to chase whatever I tossed at them. The bead head Simi Seal Leech was put back to work. My success on this particular trip was tempered by much clearer and lower water than before, and I was glad that I had brought a 4 weight instead of the 5 weight I used on the last trip. Just to be clear, I'm definitely not complaining at all. Just stating the fact that I didn't catch as many trout as the last trip. Of course, the locals are still hard at it, each person trying to catch their limit that I'm sure will be headed home for dinner. To be fair, it is better that these particular trout are caught and consumed. In another 3 months the water temperatures will be getting a bit warm for trout. I've spooked trout in the summer that have run way up into the little tributaries and are gasping for cooler water near small springs. We are talking about streams that are a couple inches deep and maybe 2 feet across. In the meantime, the fish will continue to take on more natural coloration. By May, the rainbows will be downright beautiful, at least the ones that are left. After that, it is a shame that they have to die in the heat. There are some BIG mayflies that hatch later in the year in the creek. Imagine if there were 20 inch browns and rainbows in there. By the time I decided I had entertained the rainbow trout enough, I started wanting to catch some bluegill. No problem! I just needed to hike down to the lake and look for some sunny spots. Along the way I paused for more pictures, then continued my hike. 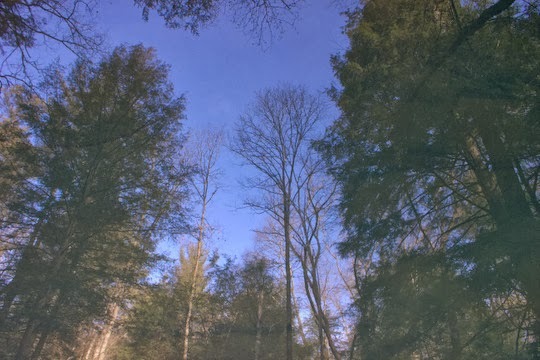 As I hiked around the lake, I kept one eye on the trail and the other on the water. 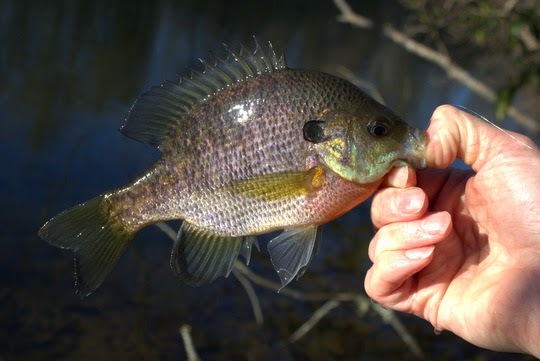 The bluegill are grouped up right now, mostly in warmer sunny shallow spots. They will be spreading out more and more over the next few weeks as they feed heavily right up until the spawn. I finally found my fish and had a blast catching a few. Each good fishing story has at least one tale about the one that got away. I'll keep this brief, but will say that I never actually saw the fish so it could have been a true giant. That's my story, and I'm sticking to it. The fish hit on the second strip after I had cast to a down tree along the shore. I thought I saw a shadow racing after the fly but that could be my imagination. The fish ran hard so it could have been a big 'gill using it's body to fight or it may have been an early season bass. Either way the 4 weight couldn't turn the fish and the fly came loose shortly after. At least I know where to go back and try again. By this time, the sun was getting low, and I was getting both tired and hungry. Heading back to my car, I was pleased with another successful outing and glad that I didn't have far to drive back home. I'm sure I'll be back here again soon! The one good thing about being a fishing guide is that you naturally go through a lot more gear than the average person. Between gear for clients and your own fishing gear, it takes quite a lot of stuff to keep pestering all those fish. Today I was happy to see a package containing probably 30 or so leaders as well as both monofilament and fluorocarbon tippet and some more fly boxes. You can never have too many fly boxes. It was actually kind of nice to be ordering tippet in the 100 m spools for a change instead of my usual 30 m.
Also on the way is a new pair of waders. I go through waders way too fast. My last pair enjoyed a trip through a briar patch that led to some intensive patch work. Now the leaks are just too constant to keep patching. This time around I'm going to try the new Orvis Silver Sonic Guide waders. I've been a big fan of Simms although my last pair of waders were Chotas which were SUPER comfortable. I haven't bought Orvis waders since my very first pair ever so it must be time to give them a shot again. I'll try to get a review up of them here on my blog once I've had a chance to try them out a bit. ...with a 90% chance of good fishing, and I'm stuck here at home. The clouds moved on late Saturday and haven't left yet. I almost pulled the trigger on a Smokies trip on Sunday and then again on Monday, but the streams never spiked up enough for me to justify the cost of gas. Today, when I woke up, the first thing I noticed was that it was still cloudy. According to the weather guys, we might actually see some clearing tomorrow. If it would just warm up a tad I would head out and find some willing bluegill, but there is still a chill in the air that makes it tough to imagine that they will be biting well. The trout, on the other hand, are probably doing might fine right now. The best part of this lingering cold weather is that summer and fall should be fabulous this year, and that doesn't just apply to us locally either. Snowpack in places like Yellowstone is anywhere from average to well above average. Most of Colorado is looking good as well, except for the far southwest portion. Montana is looking great. In other words, this is the time to start planning your trips for later in the year. 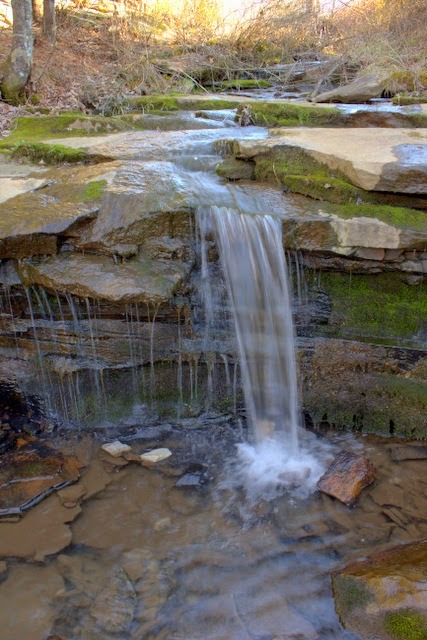 Locally, I expect a great year on all of our tailwaters as the long cold winter has stored up lots of cold water in the lakes that will help us through the warm summer months. 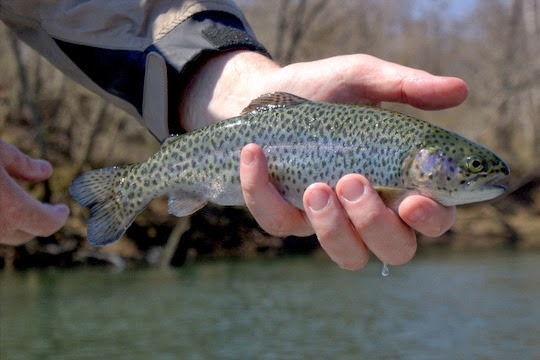 The Smokies should fish great throughout the summer unless we enter a drought, and thankfully that doesn't seem to be on the horizon right now. In fact, this might turn into the perfect fishing year as long as you weren't wanting to fish in the southwest up through Oregon. That is the one corridor with WAY below normal precipitation this winter. If I can help you with a trip locally here in Tennessee, or if I can help you plan a trip to Colorado or Yellowstone, please let me know. 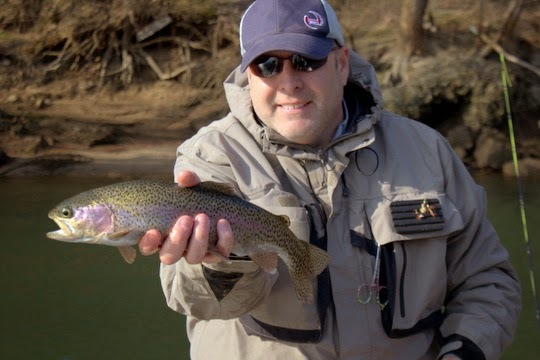 I'm currently booking trips locally through the end of May which, by the way, is generally the number one best month for fishing here in Tennessee. The fishing for the next month should be great as well since most people will be done with Spring Break and our rivers and streams will be mostly devoid of people until mid-late May when school gets out. A sure sign of spring, early season wild flowers have a way of lifting the spirits after the cold months of winter. My favorite flowers are not exactly wild though. 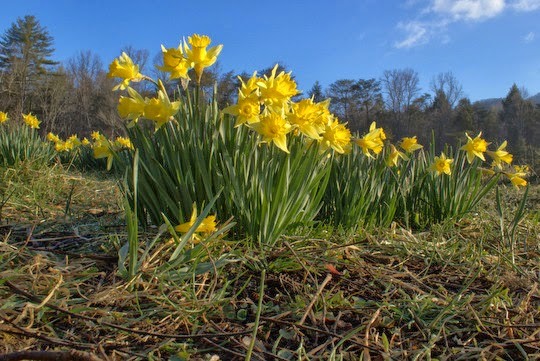 In Cades Cove, most of the old homesites have at least a few daffodils still returning each year to brighten up the early weeks of spring. 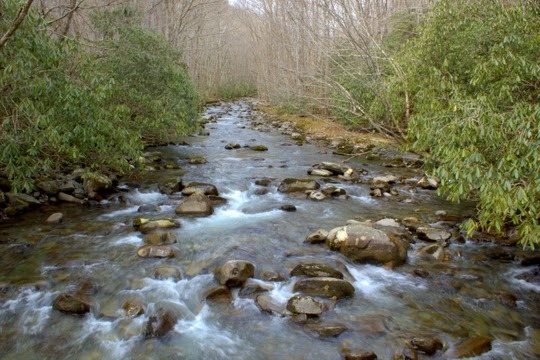 Perhaps we can consider them wild in the same sense that we consider the rainbow and brown trout of the Smokies as wild. Each year I look forward to seeing these flowers. 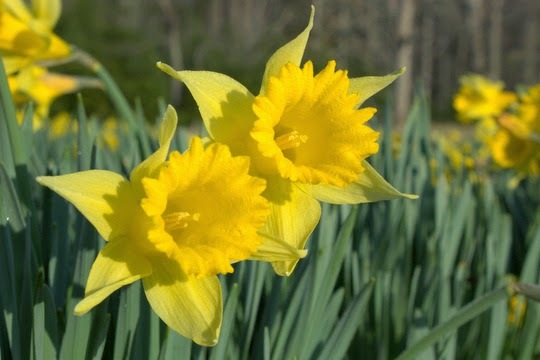 The ones at home usually bloom after the ones in the Smokies. 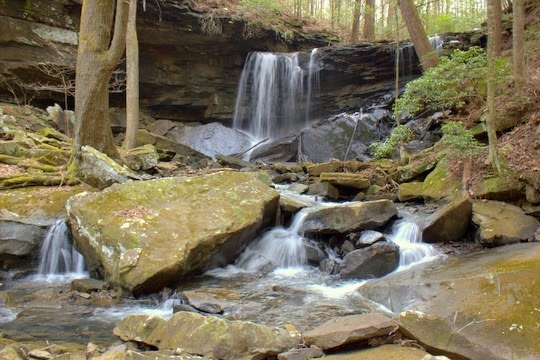 For some reason the Cumberland Plateau tends to be a bit colder in the spring. The ones in our front yard are getting close but have yet to actually bloom. Seeing them in the Cove last week was definitely a treat! 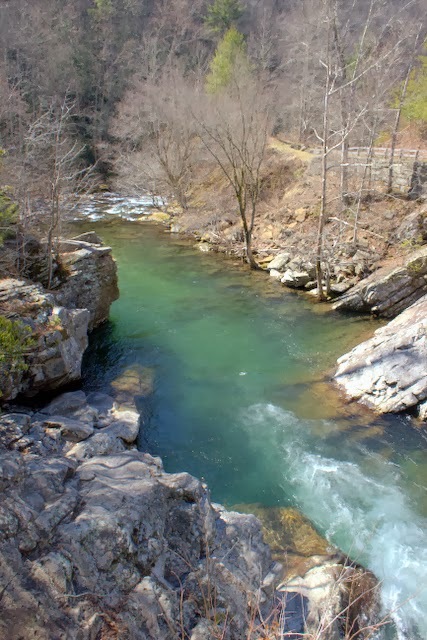 While it requires a bit more of a drive then the Tennessee side of the Smokies, I always enjoy my trips over to places like Smokemont and Deep Creek. Perhaps this is because the vast majority of my trips to the North Carolina side of the Park have happened with friends. Outdoor adventures are almost always better when you can share them with someone else. Some of my friends who are still in the education field were on Spring Break. After a few phone calls and text messages, everyone agreed that a camping trip would be nice for a couple of nights. It's not the same epic type of trip as our Spring Break trips of old, such as to the Everglades or Grand Canyon, but sometimes a couple of days to relax are better for the soul. Naturally I took along my two favorite toys, a camera and a fly rod. The fishing was just starting to heat up over on that side of the Park. I did not exactly catch a ton of fish, but all were nice healthy brown trout so I wasn't complaining. 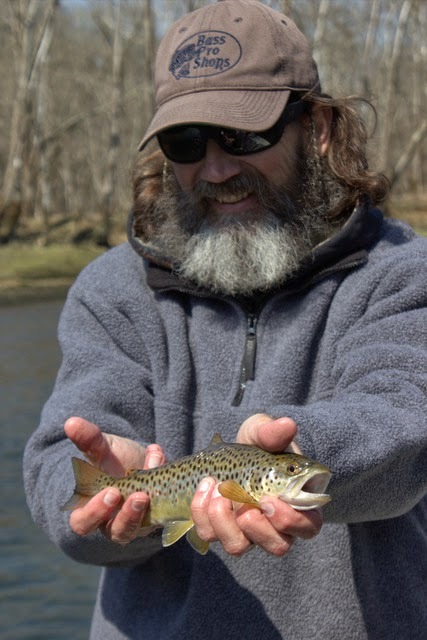 The hatches were still nonexistent there the first week of March other than the Little Black Caddis. Things should be much different by now with the fish starting to respond to the increase in available food. While I did enjoy the fishing, the trip was mostly about time with friends. We went on a short hike up the trail above Smokemont along the Bradley Fork which was the first time I've walked up above the campground. The water is beautiful up there! I'll definitely have to return later in the year for another adventure over there to fish the Bradley Fork a bit more. 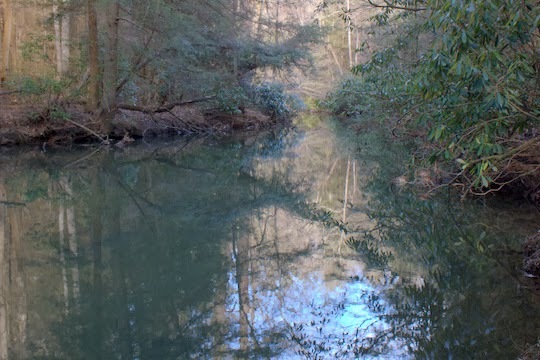 I've fished the majority of the major streams on the North Carolina side as well as some smaller tributaries at least a few times each, but for some reason I keep ignoring this stream. Doesn't this water just beg to be fished though? All in all it was a great chance to catch up with friends, spend a bunch of time nursing a campfire, and even take a few pictures. 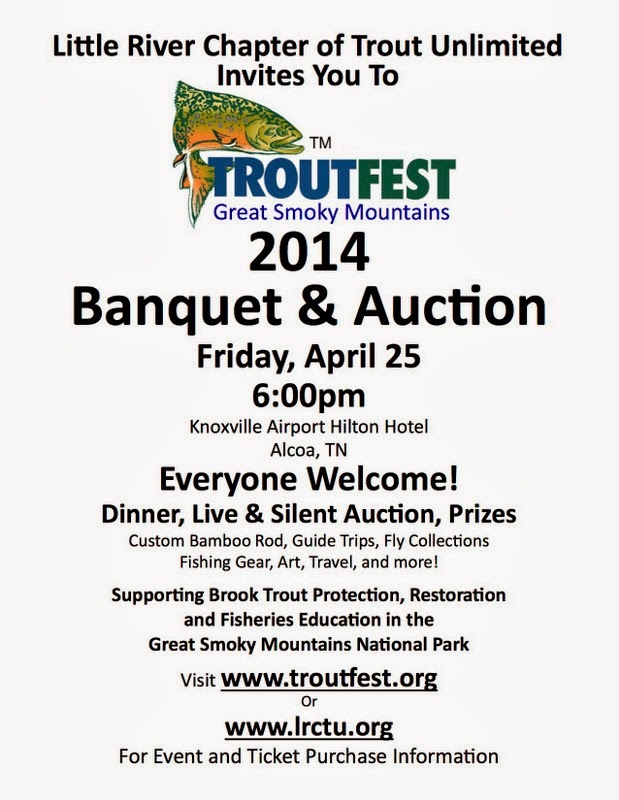 Interested in learning to fish in the Smokies and looking for a guide? Contact me at TroutZoneAnglers@gmail.com to discuss setting up a trip. As I mentioned in my last post, I always am keeping my eye out for opportunities to combine hiking and fishing. Hiking helps me focus on my surroundings a bit better. While fishing, I tend to get so caught up on what is happening on the water that I forget to notice the scenery. The hiking allows me to enjoy the best of both worlds. Wandering through the woods with a camera over my shoulder and a fly rod in hand is my favorite way to get out in nature. 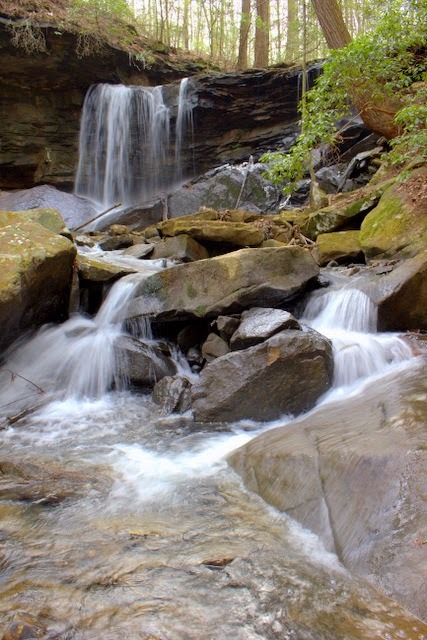 A favorite local destination is Cumberland Mountain State Park. In the winter, Byrd Lake is the recipient of quite a few rainbow trout. 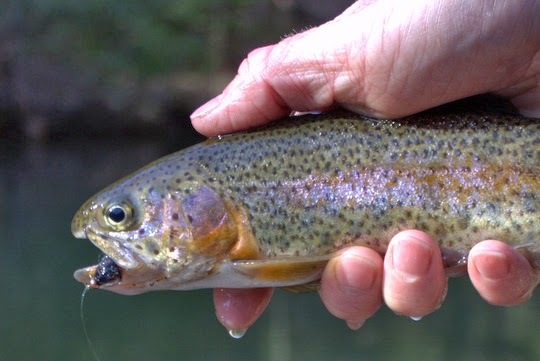 As we move into spring, the trout that have managed to elude the catch and fry crowd start to color up and look more healthy. After all, trout weren't meant to live their lives in concrete lined runs. They quickly begin eating more natural food and can usually be found rising to midges in late winter. Even though I've walked this lake since I was a little kid, I never know what I might find so the camera must come along. On this particular day, it was first employed in photographing some of the trout I was catching. One of my favorite patterns for stocked trout is the bead head Simi Seal Leech. Incredibly easy to tie, it also happens to hold up pretty well to a good chewing. This picture gives you a good view of this pattern. The magic that encourages me to carry a camera happened at the upper end of the lake where the creek is still flowing. 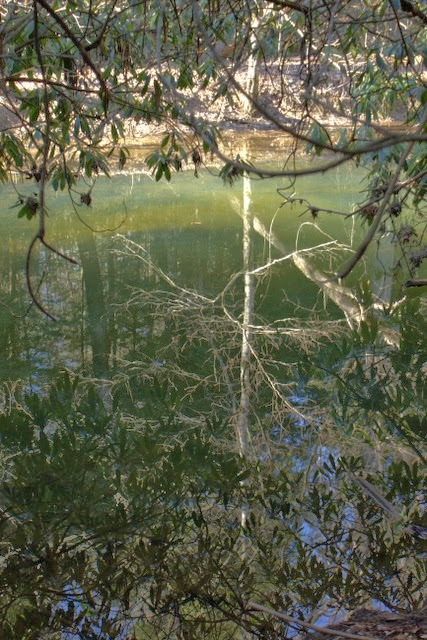 Here the waters of the creek were so smooth and calm that the forest above was perfectly reflected. 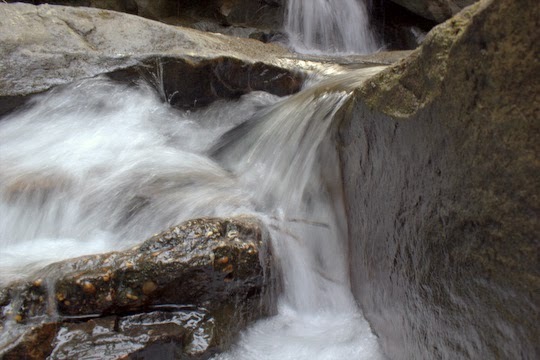 This stream can contain trout as the fish move up out of the lake. The casting is tight though and because of heavy silting over the years, wading is not advised. 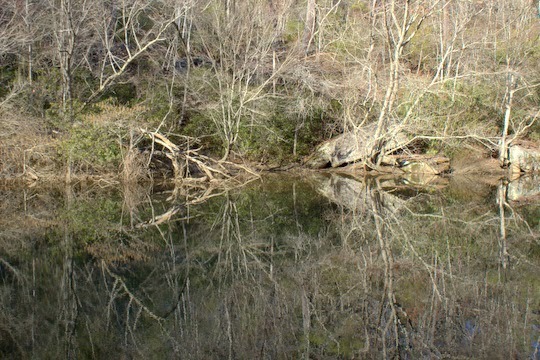 The rest of my hike was uneventful other than catching a few small bluegill. It is great to see the warm water species starting to get active. That is always a sure fire sign that spring is about to arrive! Fishing and other outdoor adventures have been front and center for the last few days. 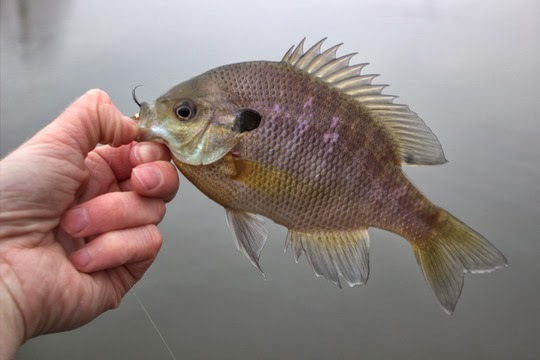 Last week I did a trip to the Smokies, a hike, a local trip for winter stocked trout, and a trip to a local pond to check out the panfish population. This week I spent the last few days with friends camping at Smokemont. 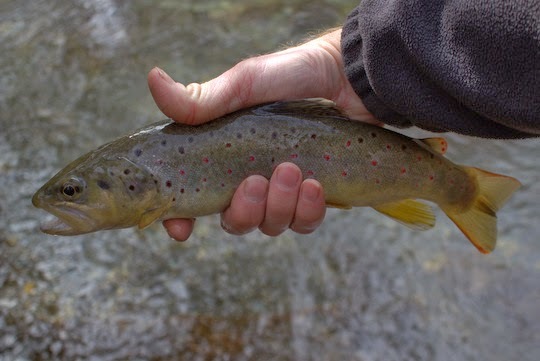 I'm happy to report that the local brown trout population on the North Carolina side of the Park is healthy. 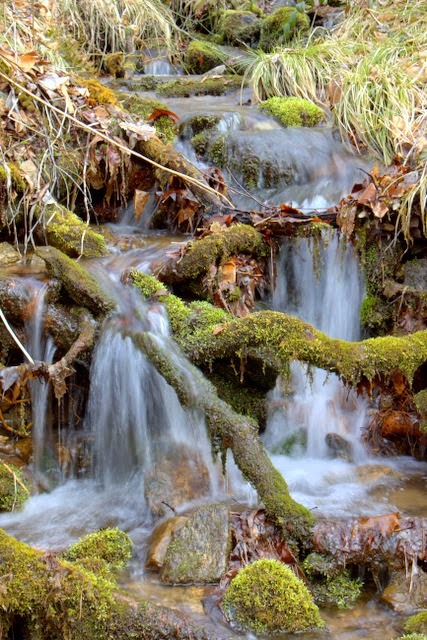 Over on the Tennessee side, the spring mayfly, caddis, and stoneflies have all started. 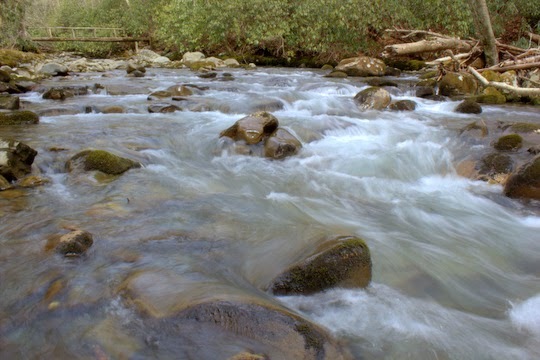 The hatch will continue to increase in intensity over the next several days so this is a good time to start thinking about a fly fishing trip in the Smokies! I will try to get some specific trip reports and stories up over the next few days so check back for more soon!